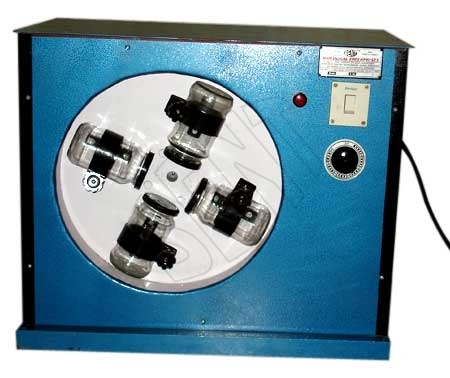 The Film Stripping Machine is used to measure the resistance of bituminous mixtures to stripping of asphalt from the rock particles. It is generally used to evaluate the mineral aggregate. We are the leading Manufacturer and Supplier of Film Stripping Devices. We use the best quality materials for manufacturing these Film Stripping Machines to guarantee full customer satisfaction. A rotating disc which rotates at a speed of approximately 100 r. p. m.
The rotating disc carries four bottles. Supplied with a time switch. Suitable for 230 volts and single phase.